Shazzer & Grubby report that McCully asked for an early release of the elections decree! An early release of the elections decree would have been last year. 7 months before an election cannot be called an early release under any circumstances. 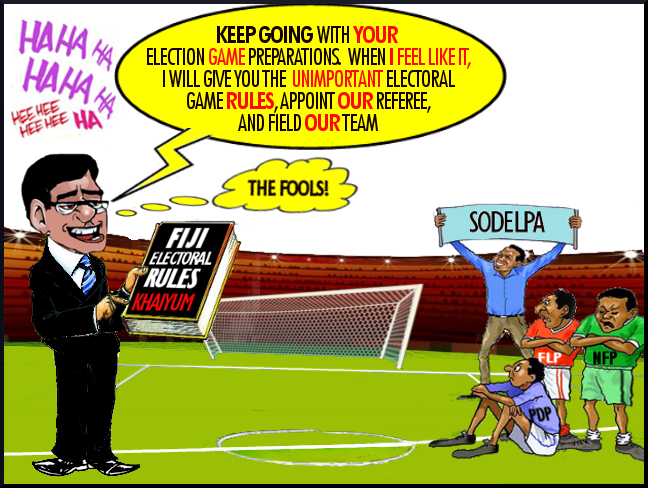 As with everything in Fiji the Electoral Decree will be released when Khaiyum thinks it will give him the maximum advantage, says Shazzer & Grubby. But what is also interesting, is how Australia and Nz are so willing to inhale all the lies and support an illegal junta that is holding the rest of Fiji hostage!. . . held hostage by guns, intimidation, torture, murder, treason, sedition, no rule of law, no freedom of speech and corruption. And now it seems that Australia's newly appointed Foreign Minister, Julie Bishop, is singing the same song written by DFAT . . . . . . what a crap leadership bloody wonder!